The dropdown menus is a great way to include a very long list of links without disordering the layout of your blogroll page. This issue can be done quickly and easily by using the SELECT tag, however this way will make your list losing flexibility and aesthetics. Through this article, author will teach you how to build very beautiful Blogroll links with the features and operations like you use the SELECT tag. Dropdown menus are a great way of including a long list of links without cluttering up your page. The issue though is that they can be hard to style, but look quite ugly if you don't. 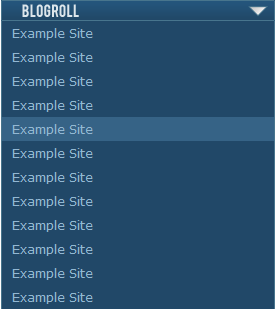 There isn't a lot of flexibility with HTML's <select> tags. Well, why not do it with plain HTML instead? In this post, I'm going to walk you through how I've set up the blogroll in our upcoming redesign. Load up the example page to see how our final product will look. The HTML we use later won't have any traditional <select> codes, so by itself, it's not going to look anything like a dropdown. We need to take care of that ourselves. The image you create can look any way you want it to, but since this is a dropdown menu, a little arrow pointing downwards is your best option for easy usability. The size of the image is also important. 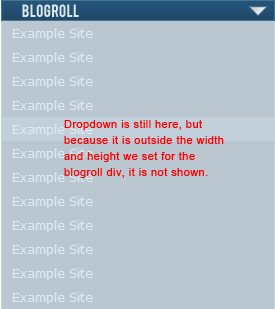 It can be any height you like, but the width will be the width of your dropdown. Now we set up our HTML. This is where the power of this method comes into play, you are using simple HTML that you can later style in any way that suits you. We need an unordered list to store all of the links. We will then precede that with a paragraph (or a 'h' tag if you prefer) to title it, and finally, we wrap the whole thing in a div. 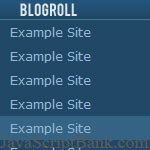 Of course, you may want to use WordPress' wp_list_bookmarks(); function to use the built in linkroll instead. Either will work. For now we are going to forget about the dropdown functionality, and simply design the dropdown as it will be when someone's mouse is over the image. The first step is to replace the paragraph text with the image we created earlier. As you can see, we apply the image as the background first. We then set the dimensions of the paragraph to be the same as those of the image, and finally, we use text-indent to hide the "Blogroll" text from our HTML. Next we have to style the list. Because our HTML is so simple, you will have no problem styling this any way you like. For instance, you can set a background on the dropdown, or add other types of HTML (Like images). Now it's time to create the dropdown. The trick is very straightforward - We are going to use the div to hide everything other than the image until the user's mouse is over it. To start with, let's hide everything other than our image. And then we just use the :hover pseudo-class to allow the excess to be shown when the user scrolls over the image. We are almost done. The rollover works, but when the menu appears, it pushes all the content beneath it down. This jumping content looks poor. We are going to fix that by using absolute positioning to put the dropdown menu above all the other content. That way, there will be no jumping when the menu comes into play. The first step is to amend the blogroll div to be positioned relatively (So that the dropdown's absolute positioning can be anchored by this div). Now use CSS to position the menu right under the image. This menu won't work with IE6 because it does not support :hover on anything other than links. You can see the full code in working order on the example page. I love the control you have over it and the fact that you aren't using any scripts so load times are as fast as they can be.